Summer officially arrives this month! Curds and Wine can help you get started on your own terrific wines to sip all summer long. Our winemaking demonstration will show you how to get started. You can also attend our "Cheesemaking Fundamentals" class to learn to make your own great homemade cheeses to take to summer parties with your homemade wines. We will also be offering some great Limited Edition Speciale dessert wines and a Gamay Nouveau to be released in the fall, just in time for the holidays -- but you should sign up for these great kits now, the spring release Limited Editions are almost sold out! Big Congratulations to everyone that won awards in the Winemaker Magazine homemade wine contest, and good luck to everyone that entered the San Diego county fair homemade wines contest! Please let us know if you win a medal, so we can mention you in our July newsletter. Join us at Curds and Wine to learn how easy and rewarding it is to make your own cheeses at home! At this class you will learn the fundamental processes behind fresh cheesemaking as well as the techniques for making pressed cheeses and aged cheeses such as cheddar, gouda, and camembert. We will make fromage blanc, ricotta, and queso fresco, and demonstrate the processes involved in making feta, swiss-style cheeses and camembert/brie-style cheeses. 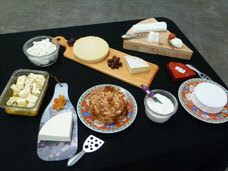 We will have samples of the various styles of cheeses you can make at home from Venissimo, as well as other refreshments. Finally, you will receive a packet with a recipe booklet to make the cheeses from the class as well as basic supplies to get you started with your cheesemaking. You will also receive a 10% discount on any purchase in the shop following the class. Join us for our FREE winemaking demonstration to see just how easy it is to make your own wine, at home or on site at Curds and Wine! We will go through all of the basic steps of making wine from kits, from start to bottle. This will be an interactive demonstration, you will have an opportunity to take part in winemaking steps hands-on. This demonstration will take about 2 hours, and then you can start your own wine! 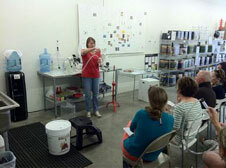 There is no charge, and you will get 10% off of any wine kit if you purchase one following the demonstration. Discover how easy and rewarding it is to make your very own wines! Vintner's Value Program: earn free winemaking at Curds and Wine! What better way to get started on your summer wines that with our Vintner's Value Program! For every 4 vintning fees you purchase, you get a 5th vintning on site for free! All customers are retroactively entered into the program, pick up your Vintner's Value Card at your next visit. In association with San Diego Amateur Winemakers' Society, Curds and Wine will be hosting bi-monthly home winemakers' seminars. Seminars are normally held every even numbered month on the third Saturday at 1 pm, but for June we will hold it on the fourth Saturday so it will not conflict with the awards ceremony for the San Diego County Fair Homemade Wine competition. Seminars for 2011 will be led by Lum Eisenman, a winemaking guru that we are lucky to have in the San Diego area. Lum will share his expertise on various winemaking techniques and issues. The topic for June is "Facilities, Equipment, and Sanitation." You can download a free copy of Lum's book "The Home Winemakers Manual" from our Useful Links page. Congratulations Winemaker Magazine Award Winners! We had several local winemakers receive awards for their wines at the Winemaker Magazine homemade wine competition. Among the winners are a Gold Medal to Ron Bas for his "Bastian Cellars" 2009 Cabernet Sauvignon port, and Mars Muller of Fallbrook won a silver medal for his 2009 Shiraz Noir. In addition, Micole Moore and Teri Kerns of Ramona Ranch Vineyards were awarded a bronze medal for their 2008 Brunello and a gold medal and Best of Show for their 2009 Zin! Winexpert has announced their Fall 2011 Limited Edition "Speciale" wine kit releases. These are exceptional kits of high quality produced in limited amounts. We will be taking pre-orders for these kits at the shop, if you are interested in signing up for one please call or email us. Preorders must be in to Curds and Wine by Sunday July 24, 2011; wine kits will be available around September. Payment will be due on pick up. Made with Gamay grapes sourced directly from France's Beaujolais region, Gamay Nouveau is ready to enjoy on bottling day, and while it will improve for a year, its bursting fruit, joyfully hedonic aromas and easy-drinking character make it unlikely any bottle will last that long. Beaujolais in France has always made vin de l'année, a young wine to celebrate the end of harvest season. Fresh and juicy, these wines are made from Gamay Noir and have a bold purple-pink color and bursting with an amazing array of fruit aromas, while their low tannin levels make them extremely - sometimes perilously - drinkable when young. This red wine drinks like a white: lightly chilled (13°C/55°F) it has hints of banana, pear, and fresh young red fruits. The official release date for Beaujolais Nouveau is set by the Union Interprofessionnelle des Vins du Beaujolais (UIVB) is the third Thursday in November, and is a celebration that goes beyond a simple harvest festival and lets people in cities and regions outside of Beaujolais toast the fruits of the vineyard with a celebration of lighthearted enjoyment. Why not start your own Nouveau party? Set a Bistro-style table complete with some homemade cheeses, a Charcuterie platter of sliced meats and pâté with cornichons, olives, French mustard and loaves of crusty baguette.